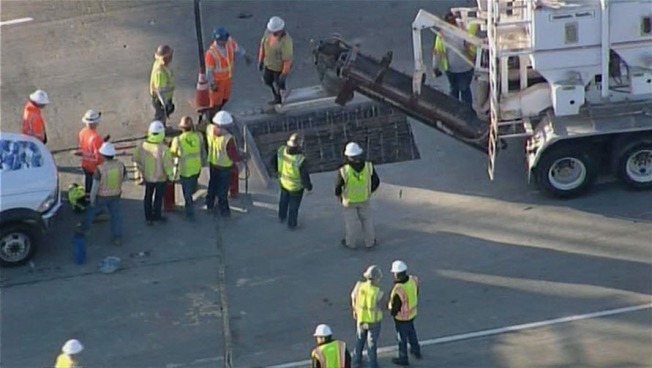 All but two lanes of northbound Interstate 680 near Mission Boulevard were shut down Tuesday afternoon while crews made emergency repairs on a large pothole, Caltrans said via Twitter. Traffic quickly backed up on the freeway and on Mission Boulevard as the height of the evening commute approached. Caltrans indicated the growing hole was in the No. 3 lane, and the estimated time of reopening the busy freeway was 5 p.m. The Fremont Police Department said via Twitter it was responding to traffic complaints throughout the city because of the ensuing gridlock and asked motorists to "be patient and obey traffic laws."